Who can tell me the year and the brand, anyone? If nothing comes to mind, just enjoy this beauty. Answer coming Monday. 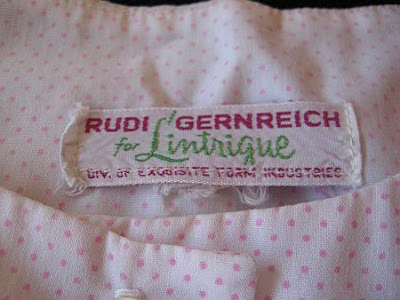 We just listed this rare nightgown set from Rudi Gernreich on Glamoursurf. This piece dates to Rudi's 1967-68 collection. The top is has tiny pink polka dots and the nightgown has turquoise stripes. There is a self covered belt made of the polka dot pattern. This piece (below), which I surmise is from the same collection, is on view on line at the Met Museum. The one we've listed is a pretty special set as you'll see in the photo below. 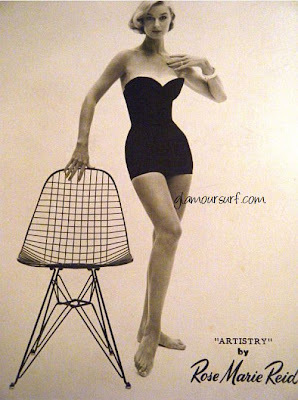 I can just see Peggy Moffitt sporting this one for Rudi. Pretty evocative, if I do say so myself. 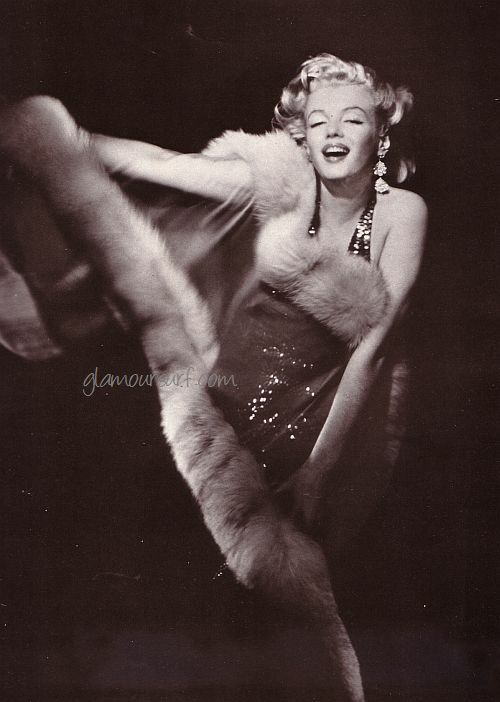 What better way to start the week than by gazing at the beautiful Marilyn Monroe. Enjoy! 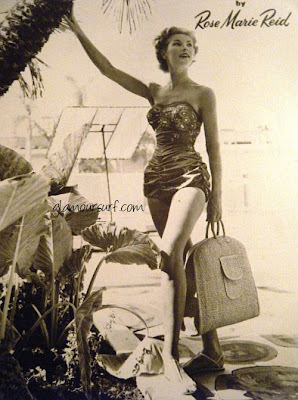 Today we conclude our series of posts on Rose Marie Reid Swimwear fashions. 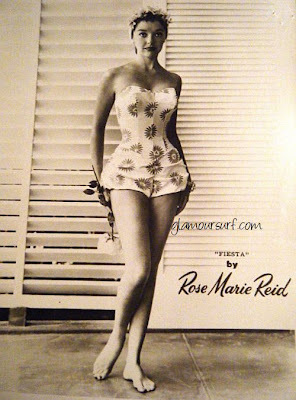 Did you know: Rose Marie Reid's innovations include the buttonless one piece swimsuit, photopermeable tan through fabric and the addition of figure moulding internal support structures like built in cups and boning in her swimsuits. 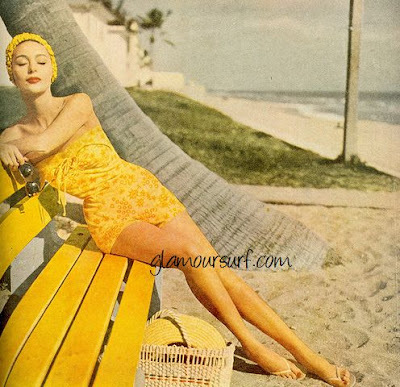 We've been looking at Rose Marie Reid Swimwear fashions this week. Today we share more with you. Her naming conventions are absolutely brilliant don't you think? 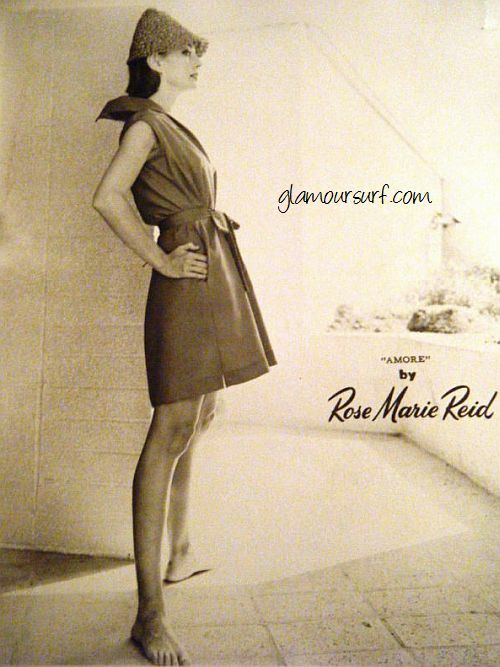 Did you know: By 1959 Rose Marie Reid's factories were producing 10,000 swimsuits per day. Be sure to stay tuned, we've got more coming tomorrow. We're on a roll this week showing more swimwear fashions from Rose Marie Reid. 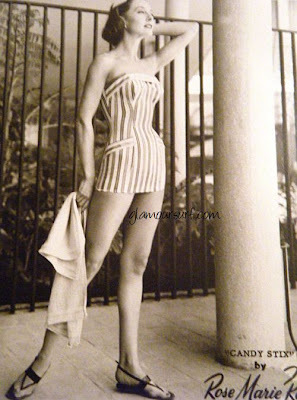 Did you Know: Rose Marie Reid's swimsuits were worn by Hollywood bombshells including Jane Russell and Marilyn Monroe. Rose Marie Reid was thanked by Marilyn Monroe as a major source of her success. If you missed the kick off yesterday you can see more Rose Marie Reid Swimwear fashions in our blog post from yesterday. The brilliant swimwear designs of Rose Marie Reid are seen in these photos which have the particular suits called out and named. 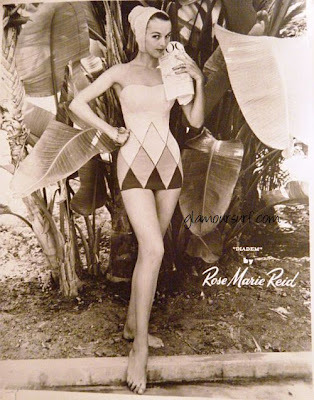 We'll be showing more of these all week along with some interesting Rose Marie Reid trivia. 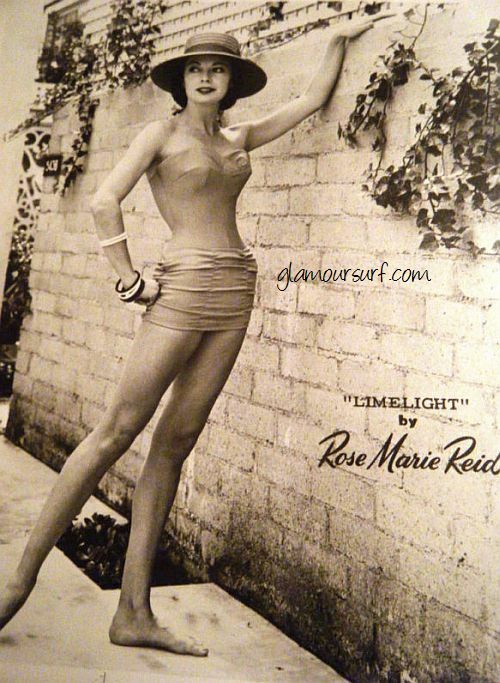 Did you know: Rose Marie Reid was the first swimwear designer to come out with more than one line per year, including a late summer line and a resort & cruise wear line. I think these are all beautiful. The cuts, the patterns, the design, even the naming conventions. Limelight sounds like some refreshing drink on a cool summers eve. I wish the photographs were in color. Do you have a favorite? More tomorrow, stay tuned! A scarf is a versatile accessory at the beach. One way it can be worn is as a turban. And it could also double as a beach wrap skirt. A girl has options! 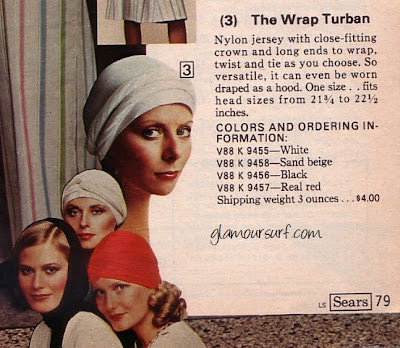 These images are from the 1976 Montgomery Ward Bicentennial Edition Catalogue Spring issue. It's interesting to note all the different styles, the boy cut legs, the difference in size of the bikini bottoms. I especially like the criss-cross back of this first image. Enjoy! Yes, rhinestones and victory rolls. Love it, swimwear from Norma Kamali. These images from her website are absolutely adorable. The styling is incredible and there is so much to choose from! It's raining here today after a week of glorious warm sun. So to brighten my day I thought I'd share some fun. Hey that rhymes! Have a fabulous day! Lovely photo's of Marilyn I just had to share with you. 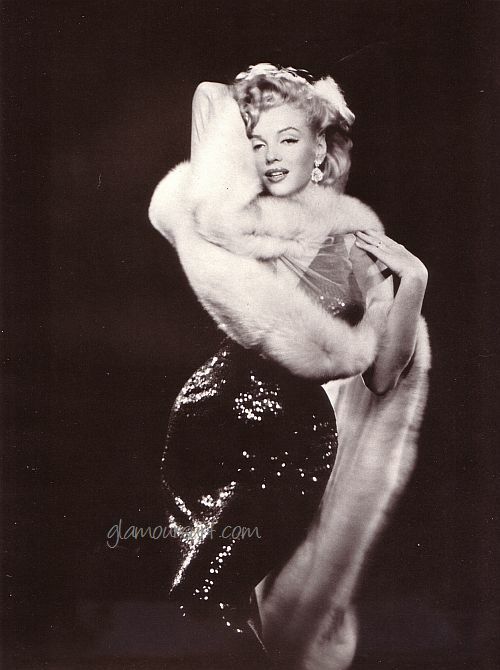 Such a bombshell! 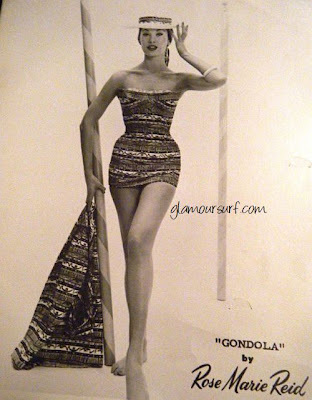 From a book I picked up called 'The Image Makers, 60s Years of Hollywood Glamour'. Swoon! It takes a good figure to wear this seasons new bathing suits. Bikinis have always made certain demands upon the wearer, but now even the less revealing one piece suits are making girls count their calories. But the new suits are also much less constrictive and more comfortable, because the are designed with a minimum of inner construction and made of soft fabrics which cling or drape. 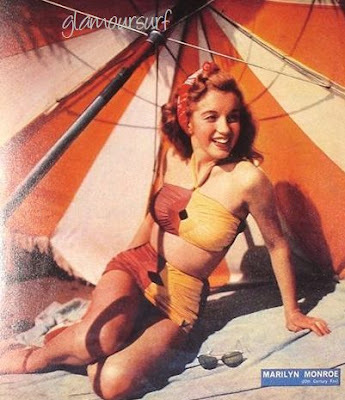 Crepe, a fabric that has been reserved for cocktail and evening gowns now turns up for swimming. Happily, designers have taken some pity on their customers and have occasionally added cover-ups. These include skirts, and pull over sweaters. Along with the feeling for the natural female form is a feeling for femininity, sometimes as all out as a ruffle, sometimes as subtle as a sash. 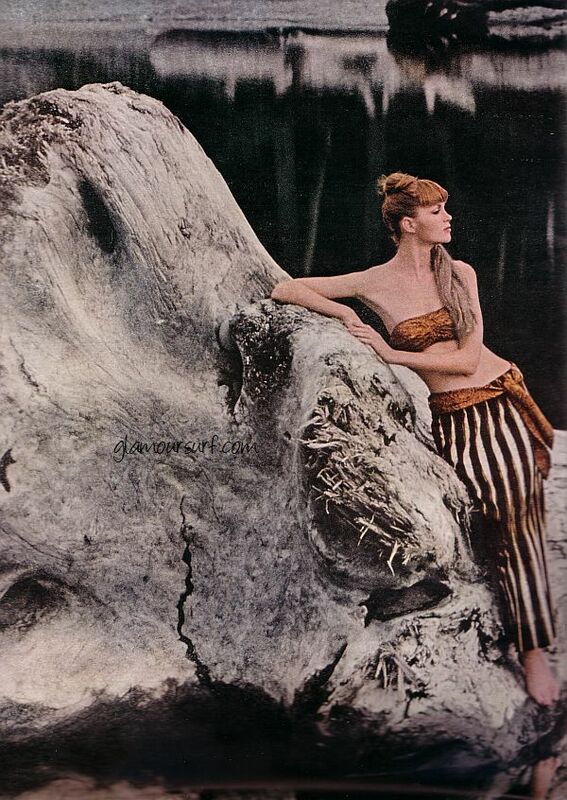 The following images are of the new suits are photographed by Don Ornitz in the Olympic Rain Forest in Washington State, a setting of untrammeled beauty which sets off these natural beauties. Enclosed by moss-covered trees, a green jersey suit by Cole of California $30.00 ($214.00 in todays dollar) has soft, bloused top, thin string straps and a sashed waist. Standing in a stream fed by glaciers from the nearby mountains, this girl wears a bikini by Rose Marie Reid, $28.00 ($200.00 in todays dollar), made of pliable leather that is treated to withstand water. 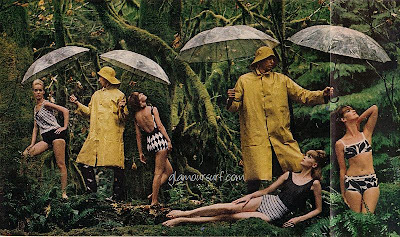 Gallantly sheltered by slicker-clad woodsmen from the rainforest's almost perpetual downpour, these girls wear a variety of patterns in black and white. From left: knit with bloused top by Rose Marie Reid $26.00 ($185.00 in todays dollar), a low-back tank suit by Jantzen, $26.00 ($185.00 in todays dollar), mixed patterns by Cabana, $18.00 ($128.00 in todays dollar) and a print bikini by Catalina $17.00 ($121.00 in todays dollar). This lady leans against a mossy rock in her white crepe suit by Harbor Road $26.00 ($185.00 in todays dollar). 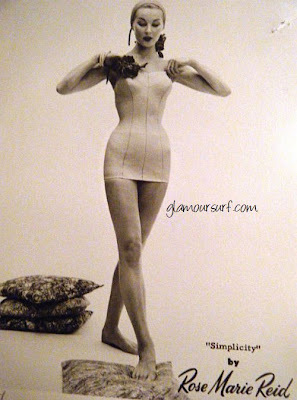 It's strapless top is sashed to give the high waisted Empire look. This is the first time crepe has been used for swimming. Lying on a fern covered bank, this girl wears a knit suit by Harbor road, $26.00 ($185.00 in todays dollar) that is as relaxed as she is. The suit is a sleeveless, scoop neck sweater pulled down over bikini brief pants. There is something faintly suggestive about this girl who peeks out from a grove of moss covered birch. She wears a turtle neck sweater over a matching one piece swimsuit by Peter Pan, $20.00 ($142.00 in todays dollar). Fabric is a new weave that simulates silk knit. Standing ankle deep in Lake Quinault, this young woman displays a printed jersey bikini by Rose Marie Reid, $20.00 ($142.00 in todays dollar) that gives her an innocent little-girl look. It consists of a flounced skirt and similarly flounced top held up by narrow straps. 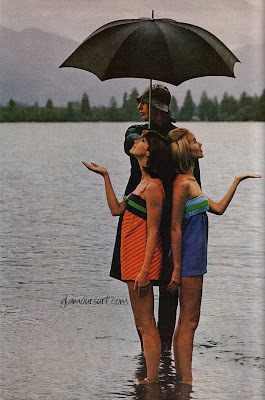 In a gray , misty afternoon at Lake Quinault - where most days are apt to be misty - and these girls are ready for harder rain. Their sister suits byRudi Gernreich, $35.00 ($250.00 in todays dollar) are bikinis and have separate skirts which pull up under the bra tops to give the effect of a high waisted one piece style. Rudi calls these designs his Kabuki suits, after the obi shape of bra. At Ruby Beach every tide brings driftwood. In her cotton bikini and overskirt byCabana, $34.00 ($242.00 in todays dollar), this girl leans against a bleached hulk of a tree that resembles some huge bone out of the prehistoric past.